Specific satellites are required for each specific task related to photographing areas. For example, it is impractical to take a photograph of the whole ocean or the entire taiga with high resolution. For this purpose it is enough to the Earth's surface images taken with the camera with a resolution of 23 m or 188 m, and this task can be handled by the apparatus of Indian satellites IRS. But when satellite images of a particular metropolis are ordered, there you need images with high resolution. For this purpose the equipment of commercial satellites of series WordView- 1 of DigitalGlobe, and satellites IKONOS, QuickBird (QuickBird-2) are used; these satellites can take photographs with a resolution of less than 1 m.
Satellite images of the entire planet occupy a huge amount of digital information, which is measured in terabytes and the higher the resolution of a particular image, the more space it takes up on an electronic media. Therefore, the satellite cameras do not take photographs of the entire Earth's surface and begin to photograph only upon the specified task and within specific coordinates. Then, the images are transmitted and processed on the Earth. If the quality of the image received from the satellite meets the requirements, the shooting stops, otherwise a shooting procedure of an area will continue as soon as the satellite will fly in its orbit above the selected point on the Earth's surface. Adverse factors for the satellite shooting of the Earth may be as follows: a heavy cloud cover, snow-covered land, peculiar area landscape, darkness hours or atmospheric features. Once an image is received, it is placed in a satellite maps database, indicating its location on the map and its collocation with the neighbouring satellite images. Images received are reduced in size for presentation to the user of the form of the satellite images with different zoom levels. At the minimum acceptable chart scale the user can see the original satellite image, and when you zoom, the image will be already presented in a compressed form, and together with adjacent images, which will also be presented in a reduced form. Downloading any area on the satellite map, you have probably noticed that the image appears in squares. This is due to the fact that all satellite images are actually divided into squares, measuring 256 by 256 pixels, which are called tiles, for faster map downloads. 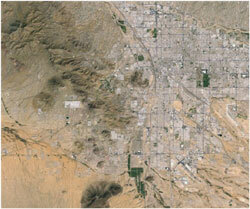 Aerial images of an area are also used to create satellite maps. This method of filling the satellite maps databases with such images is very expensive, but differs by high-resolution images of an area, and allows looking at the image on a satellite map of the Earth's surface at an angle of 45 degrees. By zooming, this image on the map is replaced with a satellite image. You can also switch to real satellite images by disabling the option 'view at 45 degrees' on the map menu. 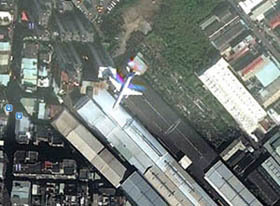 If you managed to see flying airplane on the satellite map, then most certainly, you noticed that this image is double. On one of them there is the plane itself, and side by side there is its colour 'trace'. Why is this so? The answer is simple: the satellite camera takes two photographs in one time slot. The first one is taken in black and white, and the second one is a colour image. And for those few microseconds between shots plane manages to fly some distance and therefore on the satellite map, a copy appears. Why it is necessary to take two photographs instead of one? The second (colour) image has a lower resolution and is smaller, respectively. These two images together will be smaller in size, as if it was only one colour photograph of the Earth's surface with a resolution of the camera like a black and white photograph was taken. Colour photograph is stretched and put on a black and white one, which is the basis for the satellite maps.